CueScript, a provider of creative prompting solutions with feature-rich designs for all broadcast production needs, is pleased to bring on Visual Technologies India (VTI), a major supplier and systems integrator of broadcast equipment brands in India, as a distributor. The agreement expands CueScript’s global reach, giving customers in this region local access to the company’s growing portfolio of prompting products. Established in 1996 as the exclusive distributor of Panasonic’s professional broadcast and audio product lines, VTI quickly grew into the trusted distributor and systems integrator for more than 40 international broadcast equipment brands. Today, it serves as a one-stop shop for much of the Indian broadcast industry’s professional audio and video needs. ISO 9001-2000 Certified, it has an extensive network of broadcast clients in India, including DOORDARSHAN (India’s national broadcaster), ETV, NDTV, STAR, ZEE TV and News Express, among other prominent broadcasting and media companies. CueScript is rapidly expanding its presence throughout the world with a series of distribution agreements. It recently signed on Excelencia en Communicaciones y Tecnología to represent its products in Mexico, and Techtel, to perform similar duties in the S.E. Asia region. It has already showcased its products at two major trade conventions—NAB 2014 and BroadcastAsia 2014 and will be doing so at the upcoming IBC 2014 show (Hall 11, Stand A57). 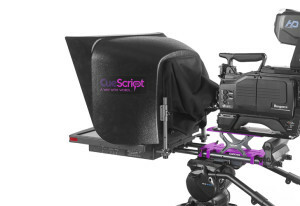 The CueScript product portfolio includes its CSM line of prompters, available in 15”, 17” and 19” models. All feature low energy consumption and a low power startup, two of the top requirements in today’s diverse range of production environments. Each has a three-mode adjustable power input that includes low (26 watts), medium (30 watts) and high (38 watts) and feature integrated mounting systems, low-profile design and an increased viewing angle (170 x 16) for easier screen readability. Moreover, built-in LED cue lights come standard with all CSM models, something that is not often an add-on option in this product category. 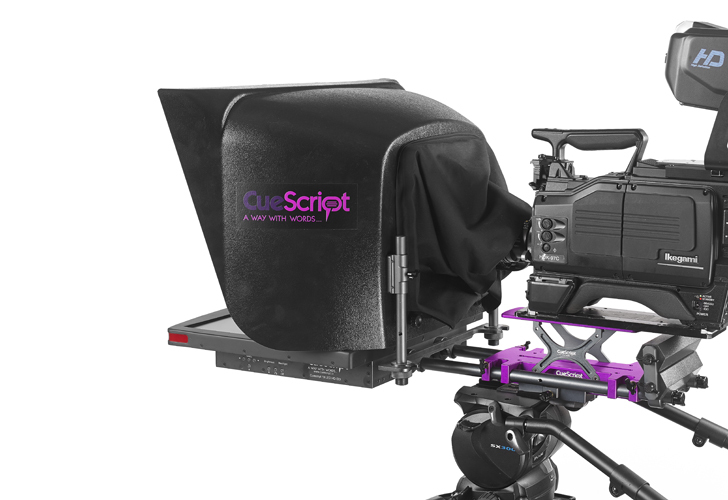 In addition, CueScript takes this feature to the next level and offers LED adjustable brightness and 180-degree viewing, providing the tools and applications necessary for a variety of productions, from an evening newscast to a light entertainment program. Finally, all CSM models meet the following requirements: CE, TUV, FCC, C-Tick, PSE and RoHs.